Last night at a hip, modern (I think) art show in Austin a guy walked over and asked me and a friend to share our thoughts on what art is to us. I immediately retreated, literally back-stepping, and said, “Umm..I am shy. Maybe later…” knowing full well I would hightail it out of there before he found me again. 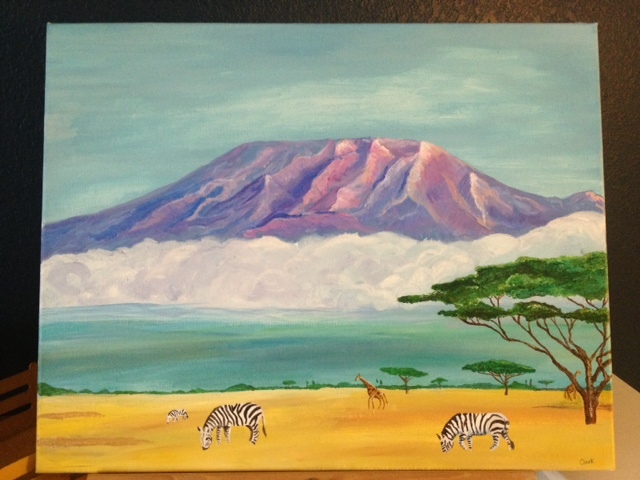 Fast-forward to 5:30 this morning when I got up and finished this painting of Mount Kilimanjaro. It is for my Aunt–in honor of my cousin who passed away suddenly this year. Soon before his passing he realized his life long dream of climbing to the summit. In honor of my cousin, Todd Miller. I thought about why I was afraid to answer the man’s question…I thought about why I am often reluctant to share my thoughts concerning things I don’t feel “qualified” to have a say about. You see, the type of art last night was very “different” from the art I am used to–no less beautiful of course, just different, and the conversations surrounding much of it seemed so far from my reach (not to mention I was definitely the only one in bootcut jeans and a ponytail).So, although I can’t go back and buck up and let the dude video my response here it is..
To me (at least today), art fills in the gaps where words can’t go. It offers a reflection of a time, a memory, a person, an emotion that can’t be described with words. It’s as if it fills in the holes within the words or shades the space within the letters to weave an incredible something that couldn’t have been there before. It transforms a feeling or an emotion into something entirely new and connects across language, social status (sometimes) and division. It can be therapy, comfort, catharsis. Even the art I “don’t get”, I want to get…or at least apply my own meaning to it and understand the perspective of others. I like the challenge of being faced with seemingly random mixed media postcards and trying to understand what the artist was thinking when he created them. Art is…whatever the heck people want it to be–that’s why it is awesome! In the edtech world, art and creativity just take a different form. Infographics have been my media of choice recently and the same creativity that launched me towards taking what was a boring list for a district into an infographic/thinglink combination influenced by a variety of minds, blogs, learning, reading and conversation… is the same creativity that glides onto my canvas when inspiration strikes and I look at other paintings, pictures and combine colors and shade mountain crevices and think about an imaginary sun and how its beams would hit the mountain. So today I’ll post this on my blog and “ship it” even thought I’d like to edit it a hundred more times. And tonight I’ll give my Aunt art where I have no words and hope it can fill in the gaps. In honor of my cousin, Todd Miller. The original painting by James Zeger can be found at his incredible site jameszegerart.com Special thank you to James for responding to my request to show my much more amateur reflection of his original work of art! Your talent is breathtaking!